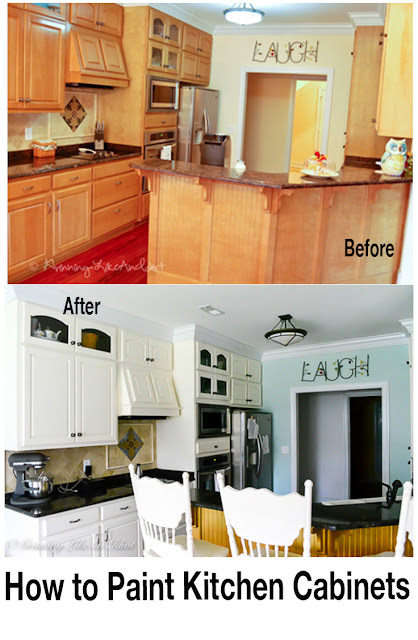 I've talked about painting my kitchen cabinets for at least 2 years. Well, I finally did it and I'm giddy with the results! Check out the steps and tools I used to paint our kitchen cabinets! Before picture. 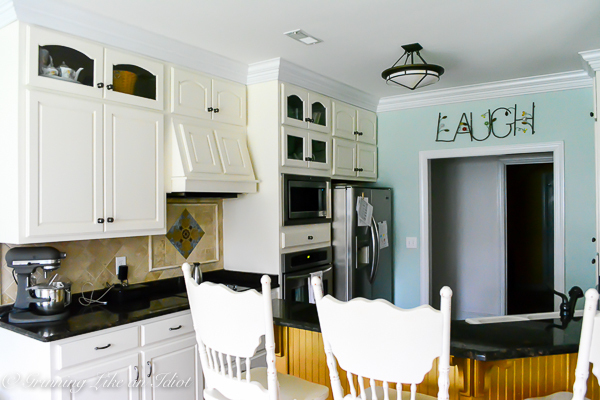 The cabinets are maple and were custom made by a cabinet maker who is no longer in business, so other than the look I had zero qualms about the cabinets - they are good quality wood! But what bothered me was how dark everything was and I kept thinking how beautiful the granite would look with white cabinets. I had bought the paint for a month just waiting for 'the right time', the reality was I was procrastinating because I thought it would be disruptive and messing and take me forever. But the reality actually surprised me. I think the key for me to do something is to not think about it too much and just start moving. So one evening, that's what I did, I stopped thinking about all the steps and just started doing. And I also remembered that I should take my time to ensure I get a professional look. 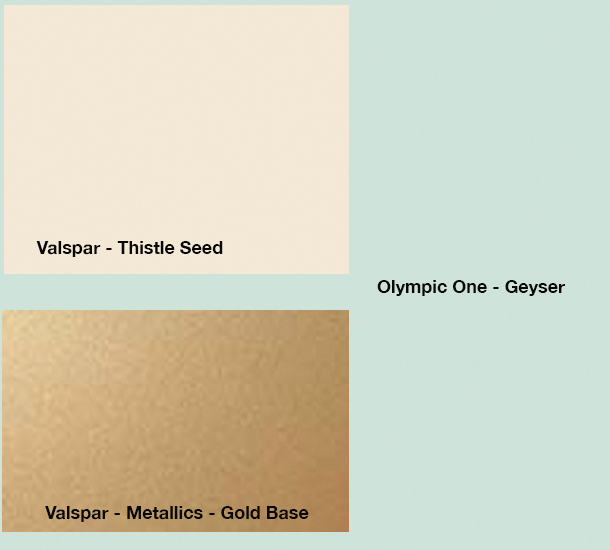 Under the bar and inside the glass cabinets Valspar Signature Brilliant Metals Gold Base. Wall color Olympic One Geyser. Paint Sprayer Used: Wagner Flexio 590 Electric Powered Paint Sprayer (if you are going to do any painting projects like this you must buy a paint sprayer! I swear on it, I've used on the bar stools and the laundry room makeover). In this kitchen I had 32 doors to paint and I was able to get the first coat of paint on them in 30 minutes thanks to this sprayer!) MUST HAVE TOOL! Half Facepiece Respirator. I strongly recommend protecting your lungs! The paint sprayer will release a fine mist that you'll notice once you leave the room so if you don't use a respirator then you will breath in that fine mist, which over time can be a very bad thing. Floetrol Latex Paint Conditioner. Add the appropriate amount to your paint. This stuff is amazing! It will help the paint dry smoothly and evenly, even when you use a paint brush. It extends the drying time a bit, but nothing that I could tell: totally worth adding to get that smooth professional look. Drop cloth to lay your cabinet doors on when you paint them. I placed all of ours in the garage. A good battery powered screwdriver. We've had this Bosch screwdriver for years and it is fantastic - not heavy or big and the battery lasts a long time. Something to lay the cabinets on to get them off the floor. I had a bunch of disposable plastic bowls let over from a party. Remove all the doors and hardware (hinges and handles). Then placed all the hinges in ziplock baggies so I wouldn't lose any screws or they wouldn't walk off in little hands. Inside of the kitchen cabinets. 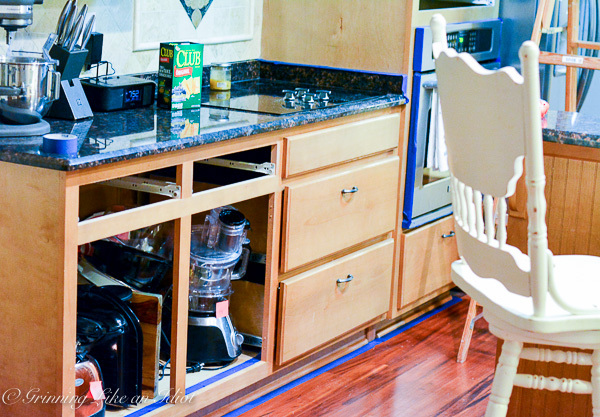 Notice how I have blue painters tape on the inside of the kitchen cabinets? I didn't paint the inside of the cabinets, just the first 1 inch. TIP 1: You don't have to remove the contents of the cabinets because you are only painting an inch inside the cabinets. TIP 2: You don't have to remove the drawers, just pull them out staggered and use painters tape to wrap around the inside so you only paint the front and back of the front panel. This way you don't necessarily have to remove the contents either! Day 2 - Paint, Paint, Paint. 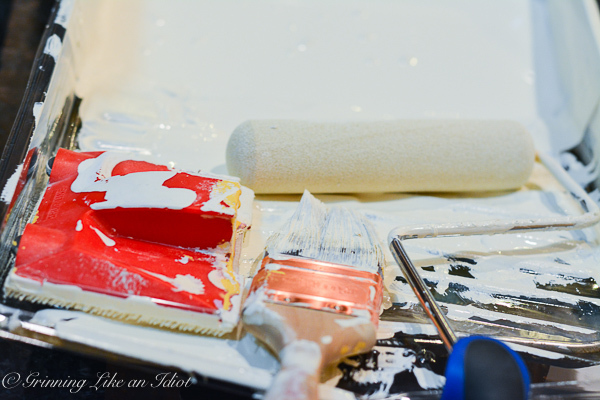 Spray a thin layer of paint onto one side of the kitchen cabinets. While the cabinet doors are drying, crank up the music and start painting the cabinets and drawer facing inside the house. In about 2 hours (or once dry), spray another layer of paint onto the same side of the cabinet doors. Let those dry overnight. While the cabinet doors are drying again, paint the cabinets and drawers inside the house again. Let them dry overnight. Flip the cabinet doors over and spray a thin layer onto the back side. Wait again at least 2 hours before applying a 2nd coat. Paint under the bar and in the upper cabinets that have glass. Under the bar I painted 4 coats of Valspar Signature Brilliant Metals Gold Base. 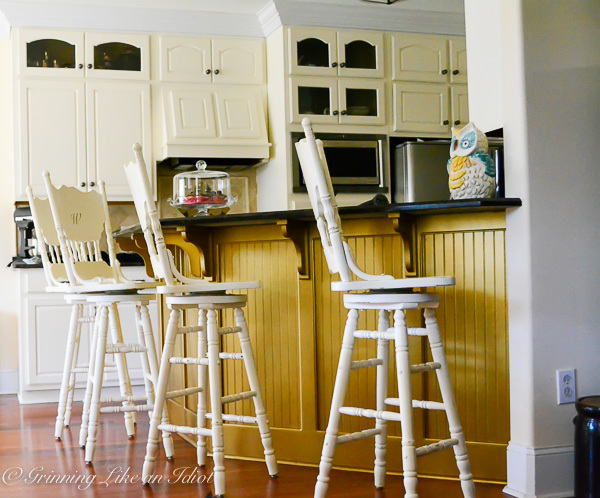 Once I have lighting installed in the upper cabinets the gold will look fabulous! Screw the hinges back onto the inside cabinets. 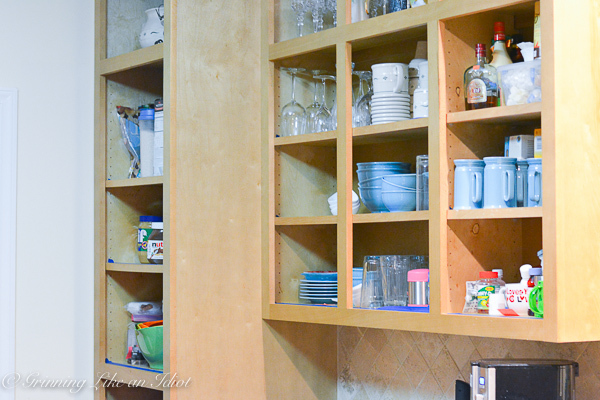 Now that your cabinets are completely dry, you can install the remaining hardware and start hanging the cabinet doors. I must admit, I was surprised it took me about 4 or 5 hours to re-install the cabinet doors. Why did it take me so long? I had to adjust each hinge to ensure the doors closed without gaps and were level with each other. Again, crank up the music, grab a screw driver and relax into it. 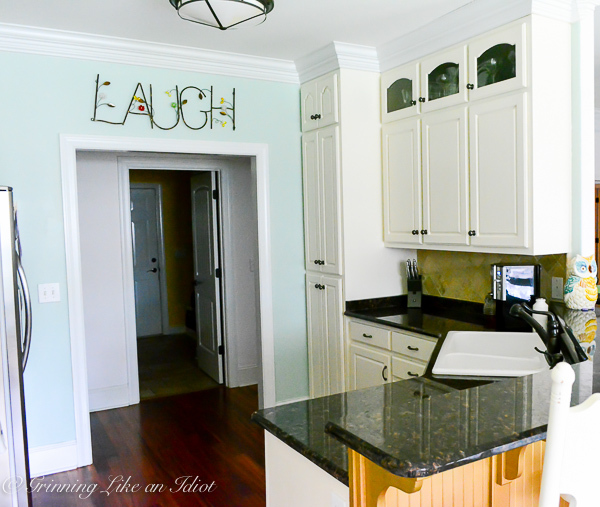 Are you ready to paint your kitchen cabinets!!!? Join our conversation on Facebook and Twitter!